New York Times bestselling author and DASH Diet specialist Marla Heller reveals groundbreaking research to help prevent and even halt signs aging through a combination of DASH-approved superfoods and strategies designed to target aging. The most trusted brand in diets--the DASH diet--has helped millions of people lower blood pressure, lose weight, and improve their health. Now, in this groundbreaking new program, it can help you look and feel 20 years younger! Marla Heller, New York Times bestselling author and premier DASH (Dietary Approaches to Stop Hypertension) dietitian, has combined key elements of the DASH diet with the latest cutting-edge research to develop a program that can halt and even reverse many of the effects of aging. 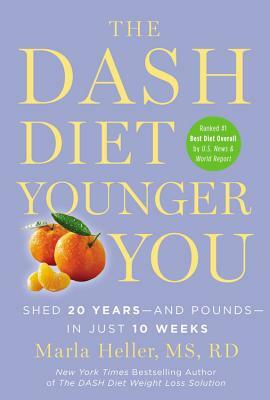 Based on the diet rated the #1 Best Overall Diet by U.S. News & World Report, THE DASH DIET YOUNGER YOU reveals five age-defying strategies designed to target the root causes of aging, including Oxid-Aging, Inflamm-Aging, and Glyc-Aging. You'll lose weight and turn back the clock while enjoying a delicious diet of antioxidant rich superfoods, satisfying plant-based meals, and foods that promote healthy gut bacteria and decrease inflammation and cravings. Featuring a natural detox that fights aging at the cellular level and proven blood pressure "busters," this powerful program will help you erase years with visible and measurable results. In just 10 weeks, you can:Reverse the diseases of agingFortify and rejuvenate hair and skinRevitalize and strengthen bones, muscles, and jointsImprove heart health and blood pressureLose weight, especially in the tummyLook and feel younger, healthier, and slimmer!Complete with 28 days of meal plans and over 75 delicious recipes, THE DASH DIET YOUNGER YOU has everything you need to look and feel years younger!